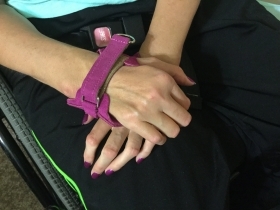 are designed to assist quadriplegics and those with dexterity issues in maneuvering their wheelchairs as well as being a trusted tool while transferring, a helpful aid in dressing and an invaluable resource in various daily activities. 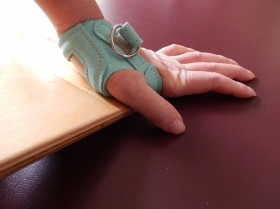 Custom made of quality suede with tacky rubber palm inserts, the gloves are tough enough to provide miles of pushing yet retain their smooth, comfortable feel against the skin. 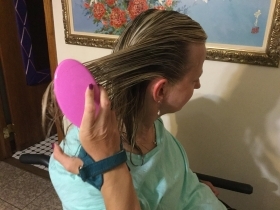 The gloves are designed so that the rubber palm is situated on the heel of the hand providing for optimal transfer of power to your wheels as the rubber "grips" the push rims making it less strenuous on the user. 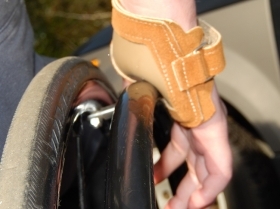 This design also provides cushion and protection to the skin in the palm area when pushing or braking. When wearing these gloves, most of the hand is left exposed for a more natural appearance. They may seem somewhat stiff and awkward at first but like many leather/suede products a short break-in period will result in a much more comfortable fit. Most customers find wearing them for a few hours on the first couple of days is sufficient. 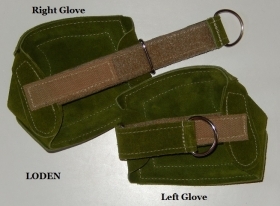 They are held in place by a sturdy hook-n-loop strap with a d-ring to allow for easy on and off. 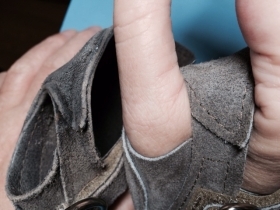 The gloves are worn so that the d-ring is pulled toward the thumb. The gloves come in a variety of colors--shop now and four sizes--sizing guide. They can be machine washed and dried but because of the risk of bleeding should be done with like colors or hand washed and air dried separately. When laundering, make sure the strap is in the "closed" position.